Your yard is already home to insects galore, so why not give bees a proper place to rest their wings? 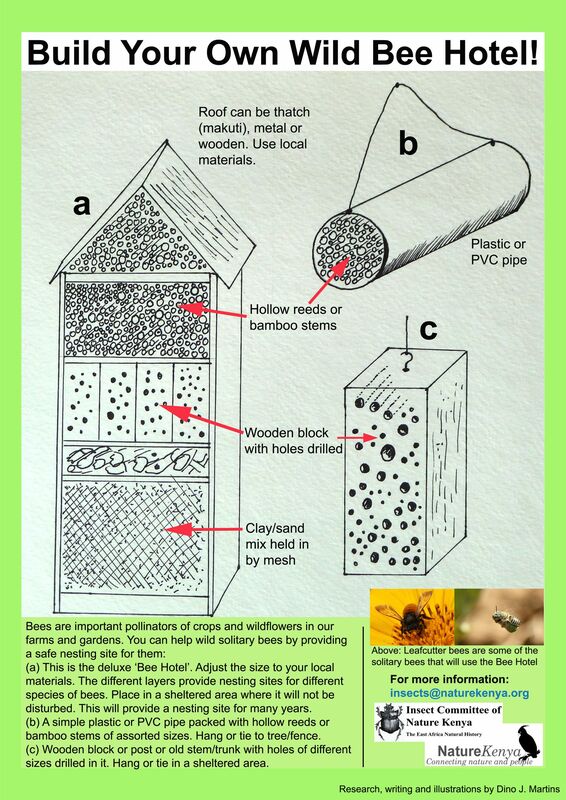 Bee hotels, also called nests or houses, are a great way to attract pollinators to your family’s flower or vegetable garden. Bee hotels are places for solitary bees to make their nests. These bees live alone, not in hives. They do not make honey. Solitary bees are much less likely to sting than honeybees because they aren’t defending a hive. Solitary bees lay their eggs in small holes. You can tell bees are using your hotel when they make a mud “door” to cover the entrance hole. This means a female bee has laid an egg inside. After the bee hatches, it will eat a supply of pollen until it is ready to break through the mud and fly away. Ladybugs and wasps may also check out a room in your bee hotel. There are more than 20,000 bee species worldwide. Only about seven bee species make honey. Bees don't just come in black and yellow stripes. Some bees are green, blue, or brown. Only female bees are able to sting. Solitary bees' honey-making relatives are in trouble. A mysterious condition called colony collapse disorder is killing off large numbers of honeybees. Solitary bees may become even more important as pollinators if the number of honeybees continues to decrease. person who cultivates hives of bees. artificial nest for pollinator bees, made of hollow bamboo stalks or other tubular material. animal, object, or force such as wind that transfers pollen from one plant to another, allowing seeds to develop.